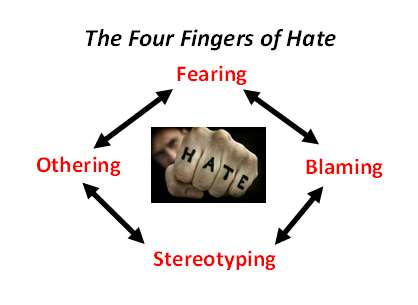 The Four Fingers of Hate: F.O.B.S. – Erik Kondo – Conflict Research Group, Intl. Ever wonder why people say and do hateful things to individuals and groups? Here is a test you can try. Think of a group of people you dislike. Everyone dislikes some group of people. After all, those people cause problems for you and society. They are all alike, if you think about it. Wouldn’t it be scary if they were in control? Basically, they are just bunch of lowlifes. See that wasn’t so hard. Maybe you thought of a whole bunch of groups you dislike. Now, let’s assume you start bumping to other people who have the same distain for the Group. They talk about how the Group is a problem, uniformly dangerous and contemptuous. You LIKE a few Facebook pages and/or join online forums that constantly reiterate this message. Vocal detractors actively preach about the dangers of this Group. They talk about how this Group is destroying your way of life. They provide examples of how the members of this Group are to blame and are all the product of an evil culture. Before long, your dislike has turned to hate and you are a full-fledged supporter of hating this Group. Immigrants, White Men, Black Men, Muslims, Christians, Jews, Law Enforcement, Men in General, Feminists, Men’s Rights Activists, Women in General, Neo Nazis, Rich People, Poor People, Pro-Life, Pro-Choice, Pro-Gun, Pro-Gun Control, Democrats, Republicans, Minorities, People with Disabilities, People on Welfare, Single Parents, Fraternity members, Sorority members, Homosexuals, Liberals, Conservatives, Fat People, Thin People, the list goes on and on. A key element key to building tribal solidarity and recruiting supporters is creating and spreading hate of a designated scapegoat group. Sharing hate is a bonding experience. Fear and spread fear of a certain Group by highlighting examples of the danger posed by people in the Group? Other the people in a certain Group through the use of derogatory terms and/or treating them as somehow less than themselves? Blame a certain Group of people for being the source of a particular problem(s)? Stereotype the people in a certain Group by saying they are all products of its dysfunctional “culture”? Now, go back to the list of Groups mentioned above and highlight the ones that engage in the Four Fingers of Hate. Most likely, you will be highlighting a lot of them. Which ones do it the most?